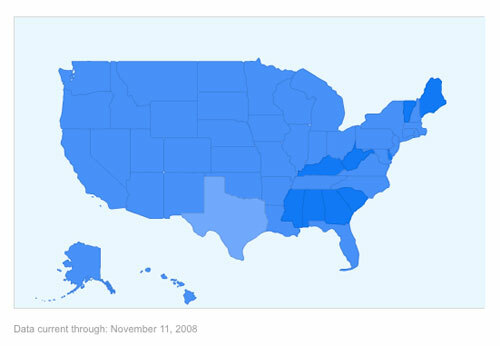 November 12, 2008 / Can you really predict flu activity by aggregating search data? Compare this to Lydia’s screenshot which shows how the map looked yesterday. “Moderate” now includes Vermont, West Virginia, Alabama, Georgia and South Carolina, and Nevada has moved from “minimal” to “low.” Here comes that spike. Oh, snap. Time to break out the Emergen-C!